A great refrigerator isn’t hard to find. There are dozens of brands, sizes, styles and optional features to choose from. If you need a new refrigerator, it can be difficult to find the best model with the best combination of features for an affordable price. What Is the Whirlpool WRB322DMBM? Consider the Whirlpool WRB322DMBM for your refrigeration needs. This straightforward refrigerator offers plenty to love and a price that fits any budget. Take a look at all the features, pros and cons and competitors of the Whirlpool WRB322DMBM. It may not have the premium features of other refrigerators, but it’s a reliable and affordable model that fits a variety of kitchen styles. There are many options and features to consider when purchasing a new refrigerator. Whether you are an appliance expert or a new homeowner, take a look at some of these features. What door style do you prefer? Most refrigerators are top-freezer, bottom-freezer, side-by-side or French-door refrigerators. There are pros and cons for each one, so carefully consider different models of each style. A bottom-freezer gives you great access to your fresh food storage and is more cost-effective than a French-door refrigerator. Refrigerators typically come in white, black, stainless steel or black stainless steel exterior colors. Many customers prefer stainless steel because it is more durable and less prone to scratches and more easily matches most kitchen decor. However, it’s typically more expensive than a smooth-surface refrigerator. The Whirlpool WRB322DMBM is fingerprint-resistant stainless steel, but you can purchase the same design of Whirlpool refrigerator in other exterior options. A new refrigerator is far more energy-efficient than older models. As your refrigerator ages, it can lose some of its insulation. This causes it to use more energy to keep your food consistently cool. New refrigerators are designed to save you money on your electric bill, so it can often be cost-efficient to switch to a new refrigerator. Compare the energy estimates of the Whirlpool WRB322DMBM with your current refrigerator in order to get a better understanding of your potential energy savings. Size isn’t everything. Many customers look for the largest refrigerator money can buy. However, you may be disappointed when you realize a 30-cubic-foot refrigerator won’t fit in many built-in refrigerator spaces. More cubic feet also can mean a higher energy bill. Instead, look for a refrigerator that gives you the most customizable shelving. A 22-cubic-foot refrigerator will feel far more effective than a 28-cubic-foot refrigerator if it has better shelving options. Consider the amount of space taken up by your freezer. The measurement advertised by refrigerator brands describes both the refrigerator and freezer compartment together. While the Whirlpool WRB322DMBM has a typical-sized freezer of 6.45 cubic feet for a 22-cubic-foot refrigerator, some models come with an unusually large or unusually small freezer. A major appliance manufacturer since 1922, Whirlpool has had many names and many appliances. While the company originally sold washing machines, refrigerators have been a main product for years. The Whirlpool WRB322DMBM represents the simple design, great quality and reasonable price that makes a Whirlpool refrigerator a great option. Overall, this refrigerator is fairly plain and simple. It doesn’t include many innovations or high-tech upgrades. While it doesn’t offer any smart refrigerator options, water dispensers or stylish door designs, it offers a great price for the cubic feet. This refrigerator has 22 cubic feet. Most full-sized refrigerators are between 9 and 30 cubic feet, so this is a mid-sized model. It’s perfect for a family or a couple who enjoys cooking from home. The Whirlpool WRB322DMBM is a bottom-freezer style of refrigerator. It’s a basic design, which isn’t as popular as a French-door style of refrigerator. However, it’s more convenient for fresh food access than a top-freezer model and offers full-sized shelves, unlike a side-by-side refrigerator. Bottom-freezer and top-freezer models are usually more affordable than French-door refrigerators, so this is a good, cost-effective option. Two vegetable crispers offer plenty of fresh food storage, with an air flow system to help keep them fresh and keep the humidity adjusted properly for fruits, vegetables or any other fresh food. While this model doesn’t offer the most space on the market, the shelves are all half-length. This allows you to divide your food into different sections, which gives the refrigerator a larger feel. The shelves are glass and are designed to keep spills from covering your entire refrigerator. The door bins are large enough to hold a gallon jug. The refrigerator door is reversible, so you can use this as a left-swing or right-swing refrigerator, or switch from one to another. A freezer is an essential part of any refrigerator, and the Whirlpool WRB322DMBM is no exception. With 6.45 cubic feet of freezer space, it’s large enough for a couple or a small family. The freezer door pulls straight out, which is more convenient than a traditional swinging door. The built-in ice maker in the freezer provides plenty of ice, but this model doesn’t include an ice or water dispenser. LED lights provide plenty of light for less energy. This model is estimated to use 584 kWh per year. For average homes, this is about $70 per year to run. This is fairly low for average refrigerators in the US, so you won’t break the bank switching to this refrigerator. Older refrigerators in particular often use far more electricity than newer appliances, so it’s often cost-effective to switch to a newer model. Like most Whirlpool appliances, this refrigerator comes with a one-year limited warranty. Unless you intentionally damage your appliance or misuse it, you’ll enjoy the peace of mind of complete coverage of both the maintenance and installation. When you purchase your refrigerator, make sure it includes both delivery and installation. Whirlpool Corporation, as well as most department stores, offers free delivery and installation with every appliance purchase. Be sure to carefully measure your kitchen and doorway to ensure this refrigerator will fit in your home. Choose this refrigerator if you want a straightforward option that is cost-effective and durable and provides plenty of space for a couple or family. At $1,599, the Whirlpool WRB322DMBM is mid-priced for a new refrigerator. There are refrigerators that are more affordable than this, but for its size and stainless steel exterior it’s a great option. You can purchase this refrigerator from the Whirlpool online store, other department stores or local appliance stores that sell Whirlpool appliances. Be sure to check out any sales, and always ask for free shipping and installation. The Whirlpool WRB322DMBM comes in black, white, stainless steel or black stainless steel. The fingerprint-resistant stainless steel options are usually $100 more than the smooth black or white finishes. However, stainless steel is far more durable and typically matches more kitchen styles. 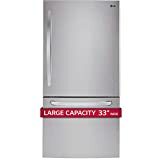 The LG Electronics' response to the Whirlpool WRB322DMBM, this refrigerator is the most spacious refrigerator at this price range. Both the refrigerator and freezer portions are larger, so it’s perfect for a large family who needs just a little more room. A stainless-steel exterior, crisper drawers and LED lighting all come standard with this refrigerator, just like most competition. However, the LG Electronics LDCS24223S has the least flexible storage shelves and drawers. Much of the refrigerator compartment is taken up by two full-length shelves. This provides plenty of room for larger items but doesn’t allow the same flexibility as half-length shelves. This refrigerator offers an ice maker with a basket and automatic shut off. Just like the Whirlpool WRB322DMBM, this refrigerator doesn’t include a water or ice dispenser. Customers love the ample storage room, great price and durable exterior of this excellent LG Electronics refrigerator. However, many customers don’t like the three full-length shelves. They don't allow extra tall bottles and other items to be stored, so many customers remove one shelf in order to provide taller storage space. While each refrigerator is very similarly priced, this model is the most affordable on the list. It’s a great choice if you want to maximize the storage space for your price while still keeping the stylish stainless-steel look. Side-by-side, the Maytag MBF2258FEZ and the Whirlpool WRB322DMBM offer almost identical features, build quality and storage capacity. Check out the sliding freezer door, built-in ice maker and adjustable shelving of this excellent refrigerator. The shelving is glass and spill-resistant, just like the Whirlpool WRB322DMBM. Like most competitors, the Maytag MBF2258FEZ offers a one-year warranty on all parts and labor. This refrigerator also comes with a 10-year warranty on the compressor. Customers love the full-length bottom drawer as well as the two crispers with humidity controls, though some customers feel the drawers are difficult to open. Other customers feel the overall build quality is poorer than that of other refrigerators. If you’re looking for a larger or more spacious refrigerator, consider the LG Electronics LDCS24223S or another larger model. A premium upgrade to Whirlpool WRB322DMBM, the KitchenAid KRBR102ESS offers a similar size and design but comes with a few great features. While the customer rating of 4.3 stars is less than the ratings of other models, this unit is still a great choice for your kitchen. Adjustable and durable glass shelving allows you to store a variety of bottles, packages and fresh food. This refrigerator also includes a metal wine rack that can hold four bottles. Whether you are storing wine bottles or 2-liter bottles, this is a handy extra feature. This refrigerator doesn’t come with an ice maker, however, so you’ll need to purchase that separately. The ice-maker kit costs $99, which makes this refrigerator even more expensive than other models. The KitchenAid KRBR102ESS has crispers, LED lights and humidity controls, just like the Whirlpool WRB322DMBM. However, it also includes electronic temperature controls. Not only can you easily adjust the temperature of your refrigerator, but it will also automatically adjust different areas depending on the temperature. Unlike other refrigerators, this model doesn’t include a reversible door. You can purchase a left-swing or right-swing door model, but you won’t be able to adjust it if you decide you need the opposite door style. Customers love the quality and energy efficiency. Many customers feel it is spacious and quiet. However, it’s also quite expensive compared to its competitors. Some customers don’t like the shelving options and size of drawers. There are no perfect refrigerators, but each refrigerator is specifically designed for certain customers. Consider which features are most important to you, and compare the Whirlpool WRB322DMBM with other competitors. Whether you are looking for a spacious refrigerator, a durable design or an affordable model, the Whirlpool WRB322DMBM is a competitive choice for many homeowners. Consider a competitor if you are looking for a compact design, a French-door refrigerator or a model that includes a water dispenser. Remember to carefully measure your kitchen, and choose the best refrigerator that fits the size and decor of your kitchen. You’ll enjoy the energy savings, large storage capacity and stylish look of this elegant Whirlpool refrigerator.